Unfortunately the forex market has not escape the impact of global deleveraging and the failure of Lehman Brothers in 2008. 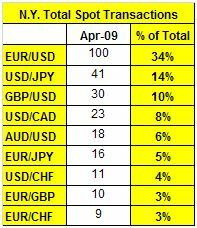 Central banks from around the world have released their semi-annual foreign exchange surveys and based upon all of the reports, forex trading volume decreased significantly between April 2008 and April 2009. Investors large and small have reduced risk with carry trades unwound aggressively. The lack of participation may explain why the major currency pairs have been stuck in a range since the beginning of May. In New York for example, forex spot trading volume fell to the lowest level in more than 3 years. 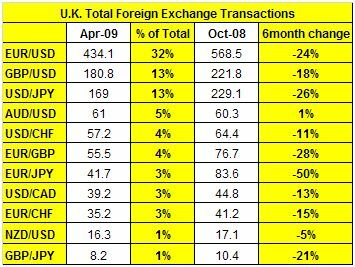 London remains the most active forex trading center followed by NY and Tokyo. The EUR/USD is still the most actively traded currency pair by far. 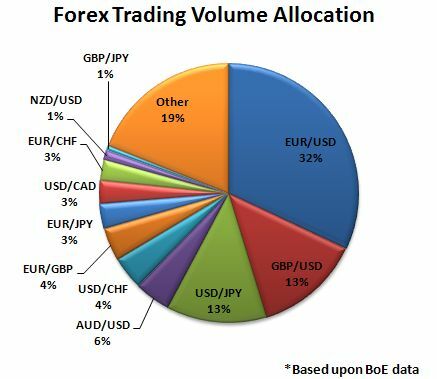 -- The most heavily traded currency pair was euro/dollar, which accounted for 32% of total turnover.